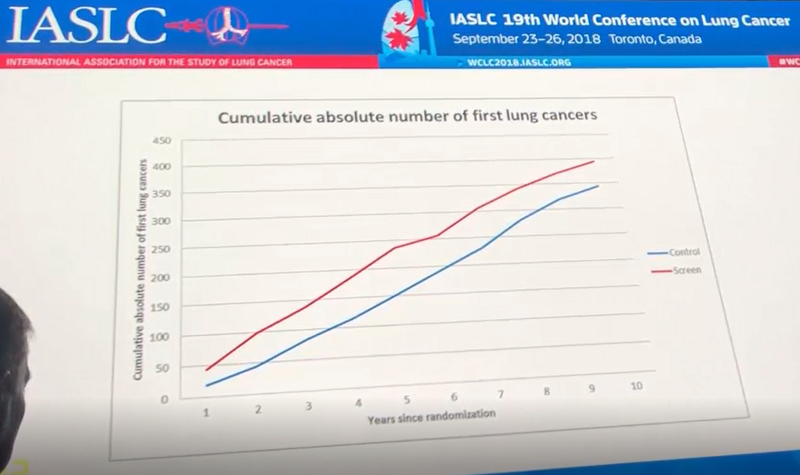 September 25, 2018, the results of the NELSON trial were reported at the IASLC World Conference on Lung Cancer in Toronto, Canada. The Dutch-Belgian NELSON trial is the second largest randomized control trial (RCT) in the world to find out if it is a good idea to screen for lung cancer. In such a screening program, individuals at high risk for lung cancer would be advised to get a yearly low-dose CT scan. On such a scan, lung cancer is visible at an early stage as a lung nodule. Check out the video I made for the Kaggle Data Science Bowl 2017 if you want to get an idea what lung cancer looks like on screening CT scans. My research group develops software to automatically interpret screening CT scans. This can be of great help when screening would start at a large scale and millions of 3D scans need to be interpreted. In 2010, the results were announced of the United States National Lung Screening Trial (NLST), the largest RCT on lung cancer screening. The results were published in the New England Journal of Medicine in 2011. The NLST was a positive trial and led to the implementation of lung cancer screening in the United States in 2015. Fourteen years after NELSON started, the results of the trial with a 10-year follow-up period for all participants were announced in a 10-minute presentation by Harry de Koning of Erasmus MC in Rotterdam. There is no full publication yet. Based on the presentation and the abstract, I tried to compute comparable numbers for the results of NLST and NELSON, and list the results and the differences between both trials. NLST enrolled 26,722 participants were assigned to CT arm and 26,732 participants to the control arm. Follow-up was until the end of 2009 for lung cancers and until early 2009 for deaths, so follow-up is between 5.5 and 7.5 years. NELSON enrolled 7900 persons in the screening arm and 7892 in the control arm. 84% were males. Results now reported pertain to a follow-up period of 10 years. NLST had a control arm where participants received three annual chest x-ray examinations. Chest x-rays are not recommended and not generally used to screen for lung cancer. But the NLST felt it was necessary to offer participants in the control arm something, to avoid they would be unhappy to be in the control arm and would arrange themselves to get a CT scan anyway. NELSON had a control arm where participants received usual care (no CT screening, no chest x-rays). In NLST all participants in the screening arm underwent three annual CT screenings. In NELSON participants received four rounds of CT screening, at start, after 1 year, after approximately 3 years and after approximately 5.5 years. So the time intervals between the scans were irregular: 1, 2 and 2.5 years. In NLST the incidence of lung cancer was 645 cases per 100,000 person-years (1060 cancers) in the CT group, as compared with 572 cases per 100,000 person-years (941 cancers) in the control group. In NELSON the incidence of lung cancer was 494 cases per 100,000 person-years (390 cancers) in the CT group, as compared with 430 cases per 100,000 person-years (340 cancers) in the control group. Note: these numbers were not reported by De Koning in his presentation, but he showed a graph where I read off the values of 390 and 340 and I recomputed them to 100,000 person-years. This is the primary endpoint of both trials. NLST: There were 247 deaths from lung cancer per 100,000 person-years in the low-dose CT group and 309 deaths per 100,000 person-years in the control group, representing a relative reduction in mortality from lung cancer with low-dose CT screening of 20.0%. NELSON: There were 199 deaths from lung cancer per 100,000 person-years in the low-dose CT group and 271 deaths per 100,000 person-years in the control group, representing a relative reduction in mortality from lung cancer with low-dose CT screening of 26.7%. Note: calculated from the reported 157 deaths in the screening group and 214 deaths in the control group, using number of participants and a fixed follow-up of 10 years for each. NLST: The rate of death from any cause was reduced in the low-dose CT group, as compared with the control group, by 6.7%. This decrease was statistically significant and the NLST is the only screening trial ever that has shown a statistically significant reduction in total mortality. NELSON: There were 904 deaths in the screening group (11.4%), versus 934 deaths in the control group (11.8%). This is a reduction in the rate of death from any cause of 3.2%. We do not know if this is significant, but that seems unlikely. NLST: Among those who died in the low-dose CT group, 22.1% died of lung cancer. In the control group, this was 25.3%. NELSON: Among those who died in the low-dose CT group, 17.3% died of lung cancer. In the control group, this was 22.9%. NELSON is a positive trial. The reduction in lung cancer mortality, the primary endpoint, is higher than in NLST. Reasons why the reduction could be higher in NELSON include: more screening rounds and a control group without any screening where the NLST had chest radiography in the control arm. Reasons why the reduction could be lower in NELSON: the participants were less heavy smokers and they were predominantly men. An analysis of the NLST results has revealed that the positive effect of screening was stronger in women. A sub-analysis of the NELSON results revealed that the positive effects of screening were much larger in women (39% to 61% lung cancer mortality reduction, depending on amount of years of follow-up used). But note that Nelson enrolled only 16% women. On the other hand, the reduction in overall mortality is much smaller in NELSON than in NLST. In NLST, 25.3% of all deaths in the control group were due to lung cancer and the screening group has a 20.0% lung cancer mortality reduction. From this one would expect a total mortality reduction of 0.253*20.0= 5.1%, close to the reported 6.7%. A similar calculation for NELSON would give a 6.1% total mortality reduction, but the reported number is only 3.2%. Note however that this 3.2% pertains to only 30 deaths in total, and with such small numbers it is hard to draw conclusions. A breakdown of the causes of death in NELSON may shed more light on this matter. The results of NELSON were eagerly awaited all over the world. Many countries are considering the implementation of a lung cancer screening program, but were waiting for the results of NELSON. For example, I learned at the conference this week that official guidelines in Japan say that there must be two large trials that are moderately positive before implementation of a screening program can start. So these results of a European trial, together with an American trial, may determine that an Asian country will start screening. I did my best to compute everything correctly, if you believe there are any errors or you have any comments, please leave a message below. Thanks.